There is a lot of German film at the Internet Archive. There are German wartime newsreels, silent classics from the German Expressionism and World War II propaganda such as Kampf um Norwegen, just to mention a few important categories. Der Mann, der Sherlock Holmes war, this week’s film, has nothing to do with wars nor expressionism, however. It is a very refreshing mystery comedy, and as the title implies there is also a Sherlock Holmes connection. 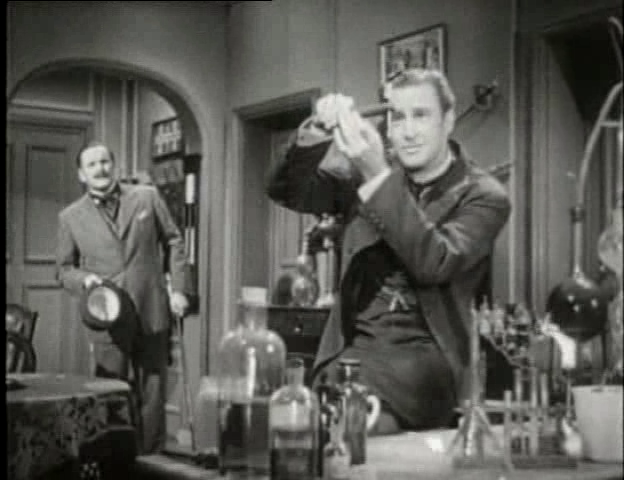 The film begins with two persons, dressed up as Sherlock Holmes and Dr. Watson, stopping a train in the middle of the night in order to get on board. We soon find out that they are not the famous detective and his companion at all. Exactly what they are after is something we are not told at this point, but everyone fall for their ruse. The train personnel do everything they can to help them, while a couple of criminals on board bolt for the woods, just in case, leaving their baggage behind. “Watson” and “Holmes” soon encounter a couple of very nice women in the next compartment and promptly develop a romantic interest. This beginning may sound a bit convoluted, and I guess it is. And even while the rest of the film follows the same pattern story-wise, it is made with such charm and skill that I am drawn into the fiction without reservation or hesitation. The Sherlock Holmes fanatic will be disappointed to learn that the “real” Holmes never shows up in this film, but as a consolation, there is a fictional Arthur Conan Doyle who appears briefly on a few occasions. The film is set largely in and around the 1910 World’s Fair in Brussels. In addition to the themes of fake identities and romance, we find elements such as rare postage stamps, forgery and a strange inheritance. The whole thing ends with a trial in a gigantic courtroom. A worthy conclusion of a film that, all things considered, must be said to be well worth a watch. There are no subtitles for this film, so stay away unless you know German. This film is best enjoyed for the brilliant actors. 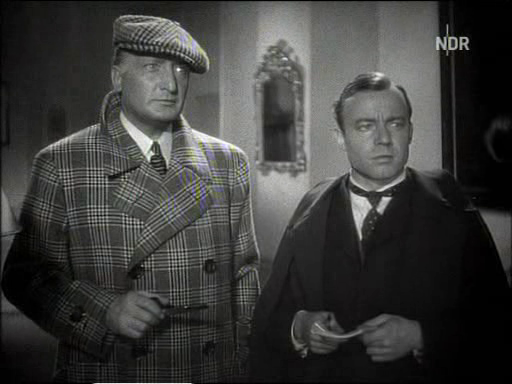 Hans Albers is often recognized for his excellent portrayal of the fake Holmes, but Heinz Rühmann is perhaps even better as his equally fake Watson sidekick. The early 1930s was an interesting time for Sherlock Holmes film fans, since there were no less than three actors playing the detective. Clive Brook (who does not seem to be represented at the Internet Archive) made two films in 1929 and 1932, and inbetween those, both Arthur Wontner and Raymond Massey debuted as Holmes within a month of one another in 1931. Massey, in The Speckled Band, debuted not only as Holmes, but it was for a fact his first-ever appearance on film. 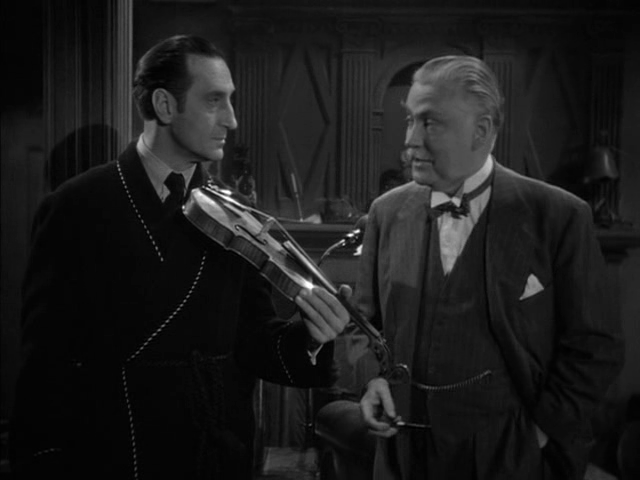 And while Wontner’s Holmes (in Sherlock Holmes’ Fatal Hour and four more films) was competent but traditional, Massey’s performance still feels fresh and original. This was not only because of Massey’s youthful and vigorous acting, but also because of his surroundings and methods. His Holmes, in addition to his flat at 107(!) Baker Street, has a hyper modern office, complete with a staff of secretaries and a computer-like mechanical database. The Speckled Band is an interesting and well-crafted film in many other ways as well. In acting as well as photography, many traces can be found from the silent era ideals. This is not at all a problem in this particular case. Especially Lyn Harding’s exquisite over-acting makes him one of the most formidable and enjoyable Holmes villains on the screen ever. The film’s editing is also somewhat ingenious. 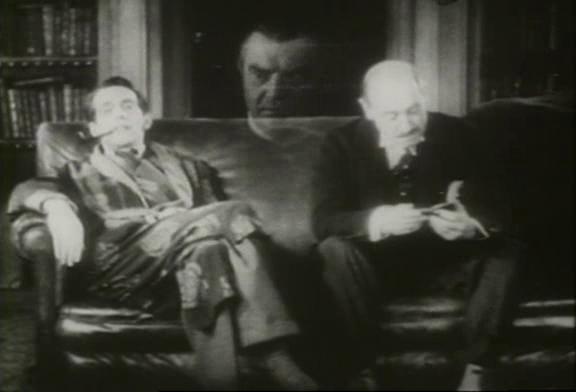 There is a wonderful sequence where Watson tells Holmes about the various persons connected with a certain case, and each person’s face appears ghost-like in the background, as if listening in on the conversation. Unfortunately, the version of the film at the Internet Archive is heavily abridged (a full 40 minutes cut out of original 90! ), and this is often painfully obvious. Many scenes are so heavily and poorly cut down that the dialogue and plot can be hard to follow. Also, sound and image quality are quite terrible. I have been unable to find a complete and restored version, so for the time being, we shall have to settle for this mutilated one. I find that the film’s many good qualities outweigh the various problems with the available copy. If you find the dialogue difficult to follow due to the poor sound quality, there are also downloadable subtitles in various formats. I have not tested these, so I cannot guarantee that they are synchronized with the version of the film that I link to. Another version of this Arthur Conan Doyle tale is available at the Internet Archive. The Adventure of the Speckled Band (1949) was part of the American TV series Your Show Time. Less than 27 minutes in length, it featured Alan Napier (who also played Batman’s butler Alfred in the classic 1960s TV series) in his only appearance as the great detective. This version may be preferable if you cannot stand the poor technical quality of Massey’s The Speckled Band, though it lacks the latter’s playfulness and originality. This film is best enjoyed by fans of Raymond Massey. Massey was a fantastic actor (as can be seen in classics such as Things to Come (1936) and Santa Fe Trail (1940)), and while The Speckled Band may not have been his best performance, it is nevertheless of more than merely academic interest. It is perhaps tempting to believe that the idea of putting Sherlock Holmes in a contemporary setting is a recent idea. Not so. That gimmick has been used at least since the 1940s, when the American producers of new Sherlock Holmes films deicded to enlist Holmes and Watson for the ongoing war effort. 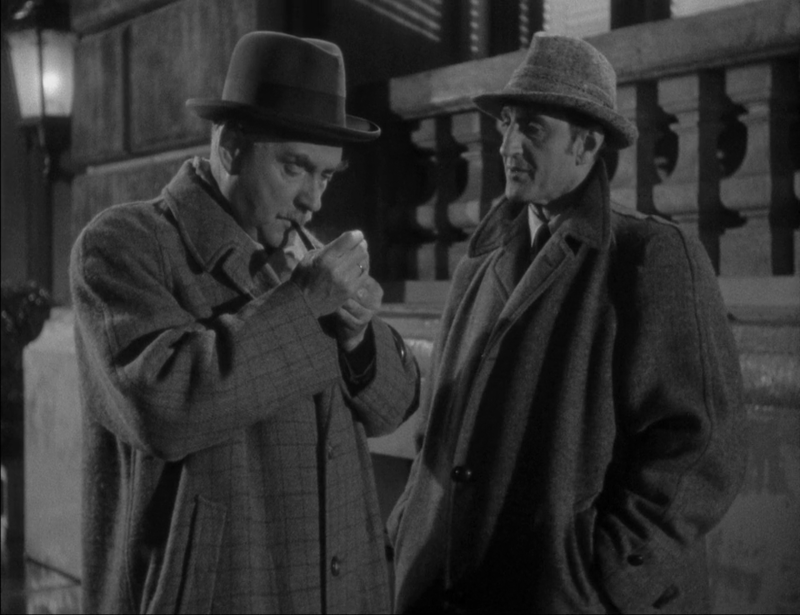 In Sherlock Holmes and the Secret Weapon, as well as several other films from the war years, they help fight Nazi spies in England. This in spite of the film being based on an original Arthur Conan Doyle story. The film begins in Switzerland, where an inventor has constructed a new revolutionary bomb sight. He wants to offer it to the English government, but the Nazis are wise to his intentions, and so the chase begins. The rest of the film depicts the efforts by both sides to gain control of the inventor and his plans. Professor Moriarty naturally turns out to be the leader of the Nazi spies, and the thing turns into a battle of wits between the two master minds. 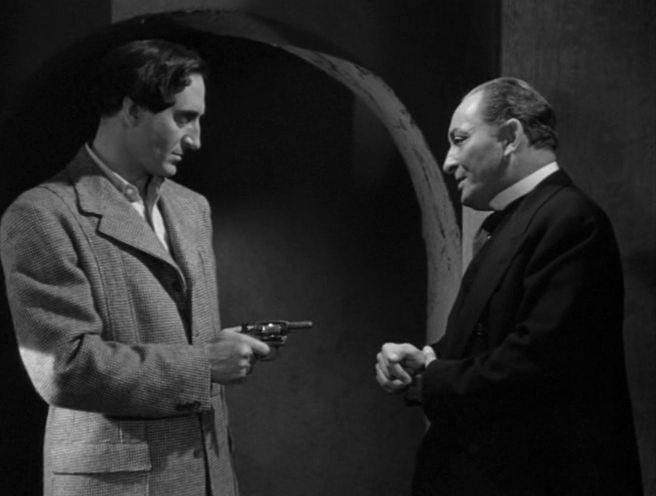 Sherlock Holmes and the Secret Weapon was Basil Rathbone‘s fourth Sherlock Holmes film, but only his second by Universal Studios (the first two were made by 20th Century Fox), and the oldest of his Sherlock films available at the Internet Archive. Fans tend to be divided regarding Nigel Bruce as Doctor Watson. Many see him as the classic Watson, but others, myself included, think he is way too thick-headed, contributing very little beyond cheap comic relief. Still, it must be admitted that Nigel Bruce was a competent actor, and he did the best he could under the circumstances. This film is best enjoyed because of Basil Rathbone’s usual excellent performance. His Sherlock is possibly the coolest and most laid-back. As much as I enjoy Jeremy Brett or Benedict Cumberbatch, Holmes on screen does not get more classic than this. 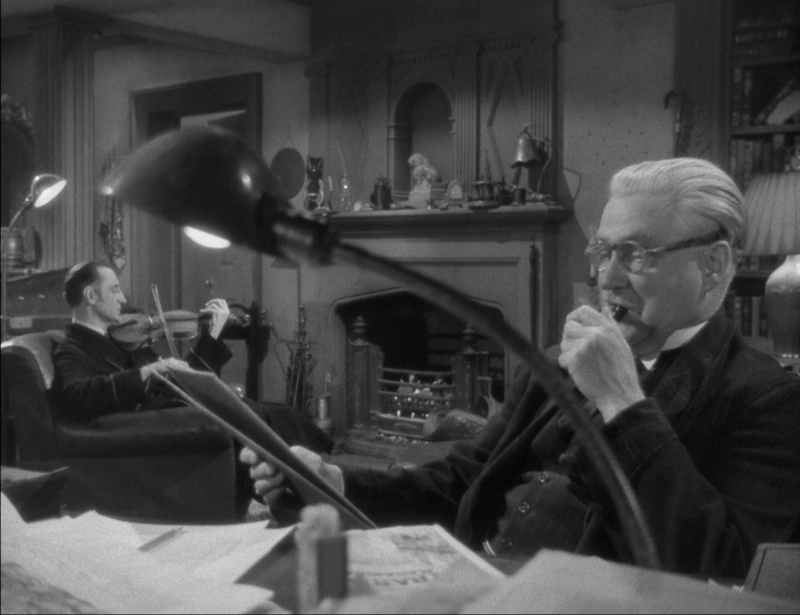 As an added bonus, Lionel Atwill does a very sinister Professor Moriarty. 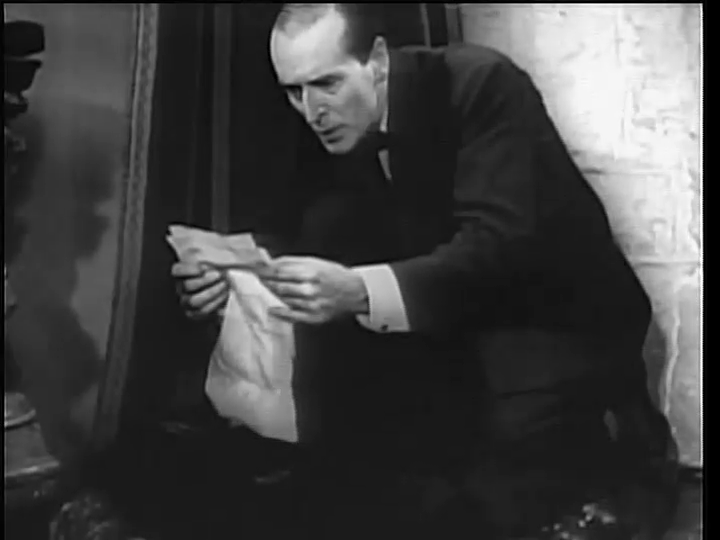 I have written before about Basil Rathbone as Sherlock Holmes. All in all, he made fourteen films about the detective, and in addition to that radio plays and stage plays. A number of the films (and several of the radio episodes) are available at the Internet Archive, among them his eleventh Sherlock film, The Woman in Green. The film opens with a voice-over narration, but as an oddity, the narrator is not Doctor Watson. The voice belongs to Scotland Yard inspector Gregson, who takes the place in the story normally held by inspector Lestrade. A serial killer is at large in London, and Sherlock Holmes is the only one who can stop him. The killer strikes at women, and after the deed is done chops off one of their fingers. The tracks eventually lead to a hypnotists’ club where Holmes and Watson face some serious peril, not to mention the notorious Professor Moriarty. For the well versed Holmes fan, this is a fairly interesting and novel story. 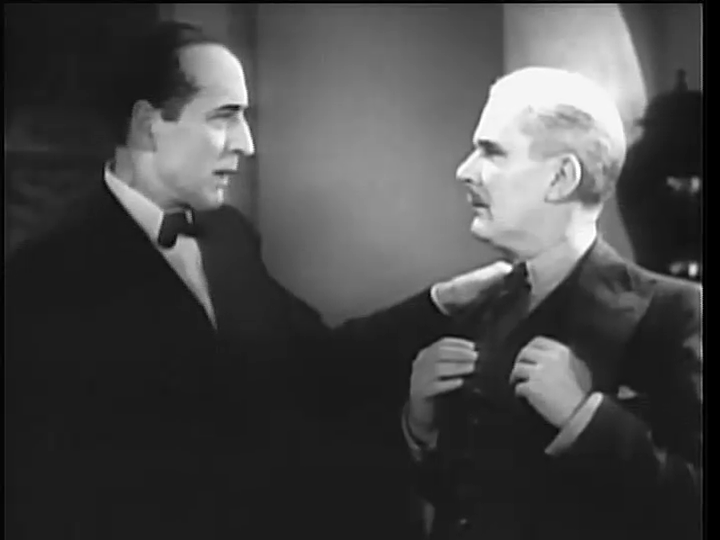 Like many other Rathbone films, it is not based on any of the original Doyle stories. There are some logical holes in the plot, but none glaring enough to take away the enjoyment of watching. The crew makes good use of low angles and effective lighting, lending a dramatic, almost melodramatic, aspect to many scenes. This film is best enjoyed for Basil Rathbone’s iconic portrayal of the great detective. There are good reasons why he remained the King of Sherlock Holmes actors for decades. And even though he may have since been dethroned by Jeremy Brett and Benedict Cumberbatch, and perhaps even Robert Downey, Jr., his performance is nevertheless a pure joy to behold. I have previously written about Basil Rathbone, one of the most famous Sherlock Holmes actors. Rathbone’s immediate predecessor, Arthur Wontner, is not so well remembered today, and there are several reasons why. 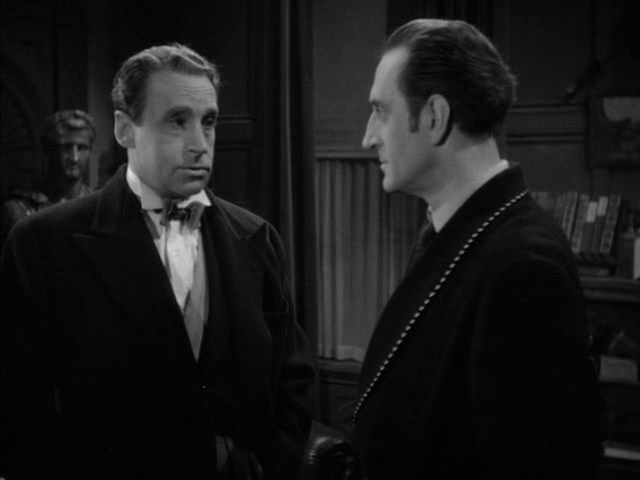 Wontner was a good actor, yet does not succeed as well as Rathbone in giving Holmes a distinct personality, and his balding head (poorly painted over) does not exactly help to maintain the image of the famous detective. Still, Wontner made five Holmes films before Rathbone took over, and they were the last British Holmes productions for a couple of decades. One of the Wontner films is now lost, but the other four are all avaiable at the Internet Archive. For a true Holmes fan, these are of course a must, but even the occasional Holmes viewer will enjoy Wontner’s best, The Triumph of Sherlock Holmes. This film holds up well in comparison with many of the later Rathbone productions. The plot is a fairly traditional Holmes murder mystery, and in fact it is closely based on one of Arthur Conan Doyle’s original Holmes stories. 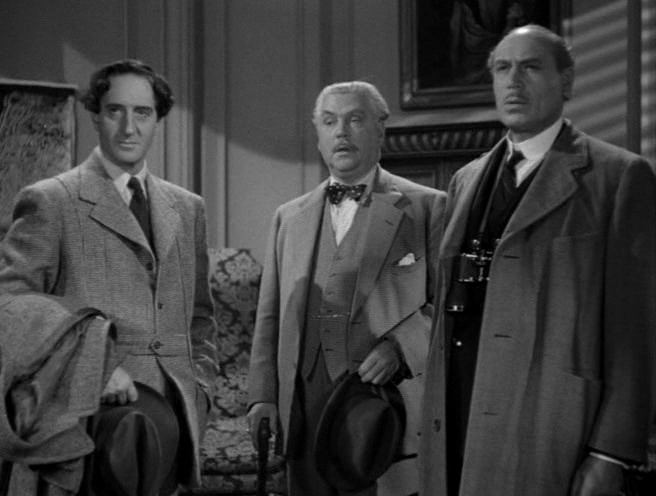 Wontner as a Holmes actor must be put in perspective in order to be fully enjoyed. Compared with the Holmes of modern productions, he is old rather than young; well-mannered rather than rude; calm rather than energetic. I think that a more knowledgeable person than myself could probably present a timeline of Holmes films and TV productions, tracing how today’s interpretations gradually emerged through generations of actors. 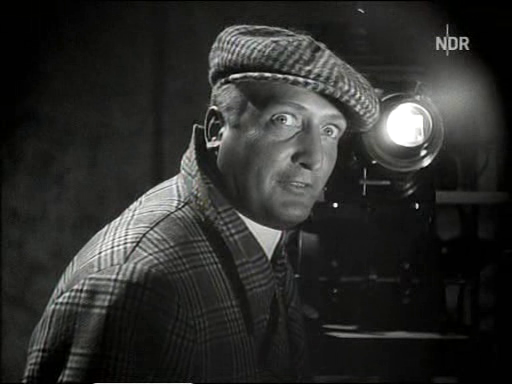 The other Wontner films available at the Internet Archive are Sherlock Holmes’ Fatal Hour (1931), The Sign of Four (1932) and Murder at the Baskervilles (1937). This film is best enjoyed if you have a good sound system. If you watch it, do not let the extremely poor sound during the first few minutes put you off. It does improve after a while, but even then poor reproduction would make the dialogue hard to make out in places. Sherlock Holmes is really hot on cinema and TV these days. I guess it took off with the two Guy Ritchie movies a few years ago. Then came BBC’s Sherlock, and the Americans just had to follow that up with Elementary. The latest news is that there is going to be a new movie with Ian McKellen as Holmes. It seems like we will have to wait a few more months for the third season of Sherlock, but Elementary starts up season two on Thursday. Of course, Elementary is nowhere near as good as Sherlock, but it helps to pass the time. Or, by all means, take a look at what came before. Elementary, as it happens, is only the second American Holmes TV series. Already in late 1954 a series simply known as Sherlock Holmes began. It only lasted for a single season of 39 episodes, but many of those are really good. This is not the modern Asperger Holmes, nor is it the almost aristocratic Holmes as played by Basil Rathbone, nor Jeremy Brett’s nervous and over-active detective. This Holmes, played by a young Ronald Howard, is playful, curious about all things, and with a constant gleam in the corner of his eye. Of course, he can be very absent-minded and annoying at times. This is Holmes. But, by and large, he is relaxed and easy-going, as screen Sherlocks go. Perhaps the best reason to watch this series is the excellent interaction between Holmes and Watson. 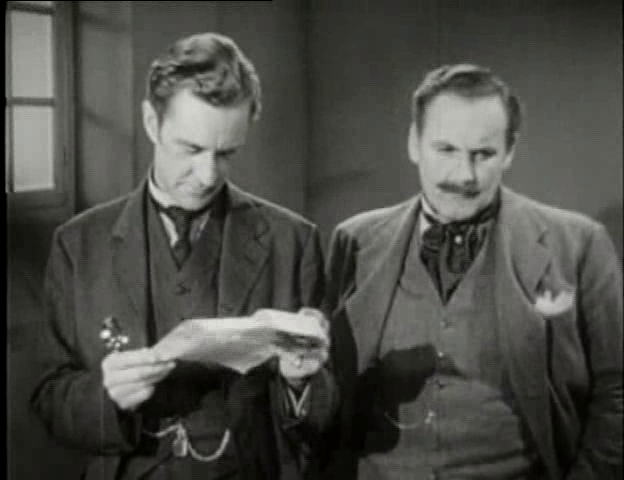 The latter was played by Howard Marion Crawford, and is perhaps closer to Martin Freeman than to Nigel Bruce, in temperament if not in outward appearance. Archie Duncan is not quite so good as Inspector Lestrade, but you cannot have everything. The sets are nice, and especially the Baker Street flat has many little details to discover. Like many American TV series from this period, it was actually shot in Europe. But not in England (which would seem to be the obvious choice) but in France, with British actors in the leading roles. This is interesting to keep in mind when watching, since it explains things like the many supporting characters with a French accent, whether warranted or not. Below is a list of all episodes that can be found at the Internet Archive. Some are available in low resolution only; those I know about are marked in the list. For a complete episode guide, see for example Wikipedia. I wish I could make a perfect guide to all the episodes, including tips for which ones are worth seeing and which are not. However, I have not seen some of them for several years, so the best I can do is to say that a few good ones are episodes 1, 9 and 39. If you like those, you might as well go through the rest as well. In my opinion, a handful of clunkers can be tolerated for the greater good. This series is best enjoyed if you prefer your Holmes in the original 1800s setting. Horse-drawn carriages, starch collars and gas lamps. Not to forget the deerstalker hat. Great stuff!